During the black arts era of the 1960s and 1970s, there were a few intense debates about the identity priorities of black poets. Were they poets who happened to be black, or were they black people who wrote poetry? In the context of the Black Arts Movement, those questions about racial and literary commitments carried considerable weight. These days, folks have lightened up. At least on the surface. Although I suspect that ideological differences continue to separate some kinds of poets from other kinds of poets, the distances between the different venues that the poets occupy reduces the chances that we will witness high profile disagreements. 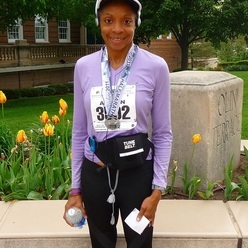 Given my own interest in how writers define or present themselves, I was intrigued when I came across the "about me" description on Allison Joseph's blog, which read: "runner, writer, poet, professor." Joseph's blog, which includes the tag-line, "a late-in-life forty-something runner learns to love her legs," provides a chronicle of her participation in various long-distance running events. Joseph has published several volumes of poetry, but in the context of her blog, she is a runner first. It matters, however, that she writes about her activities, which is how many of us who first began following her activities as a poet became aware of her serious dedication to running and fitness. Each morning on twitter and dailymile, Joseph logs in the numbers of miles she just ran before the start of her work day as a poet and professor. Reading her entries about running 2 miles in 20 minutes and 5 miles in 50 minutes is inspiring and intimidating. Joseph has at least one poem "Three Miles" about running, and she says that she'll eventually compose and publish more pieces about health and fitness in general. For now, she's putting the running first, followed by the tweets, dailymile entries, and occasional blog posts about her big runs. Interestingly, Joseph likely encounters many runners who do not know she is such an accomplished poet, and perhaps there are poets and poetry readers who have not yet discovered that Joseph is such a serious runner.